One of the most ridiculous concepts i’ve ever heard is a woman friend zoning a guy and the guy accepting it as it is. It almost pisses me off and makes me want to puke on the guy for just being friends with a woman, especially the hot ones. First, What’s this ugly word called ‘ friend zone‘ ? Friend zone is when a beautiful woman tame men as they wish. They’re never going to date with these men, or sleep with them, nor are they ever going to give the respect to these men that they so rightfully deserve. These women would just use their tamed men for favors and to listen to their petty issues. And just give them enough hope that someday, there is a chance between the two, by sometimes throwing compliments or seducing just enough to help these men’s amazing imaginations. The worst part in being friend zoned is when that bi*ch won’t even let you get into a relationship with other women by giving you irrational hopes of that glorious ‘ someday ‘. you might be thinking, why she doesn’t want you to get into relationship with others? Because then idiot, who else will she count on to do her little whimsical things. She wants to be the center of your world, even though she doesn’t give a f*ck about you. Now, 1 fact I want you to soak in is that these keys are interconnected to each other, they work like domino effects, so don’t skip them. Key #1. What’s she Thinking? What do you look like? Are you confident, congruent, centered or shy timid and a wimp? How do you dress? Do you have your own unique personality or are you one among the many? How do you carry yourself? Are you calm, poised, relaxed? What do other girls think about you? These are the flurry of questions that instantly goes through her mind. This is the first phase and a very powerful and influential one in determining if you’re going to be friend zoned or not. Now, i know you’re not going to magically transform yourself into that kind of a guy, it’s a process and this is one of its many crucial steps. But don’t worry. Slowly you’ll get the hang of all of this and you’ll know exactly what to do as you keep reading, understanding and instinctualizing all this. Always maintain your bearings and never get sucked in into her life or she’ll tame you forever like a cute little puppy. Never let her disrespect you, or take you for granted. Whenever you’re in a conversation with her, always know that you’re the one who is the powerful. She’s the one who she will have to please and work hard for and not the other way around. Never be too impressed with her and always try to show who’s more valuable. Think of yourself as you’re the customer and she must convince you to buy her product, that is she herself. 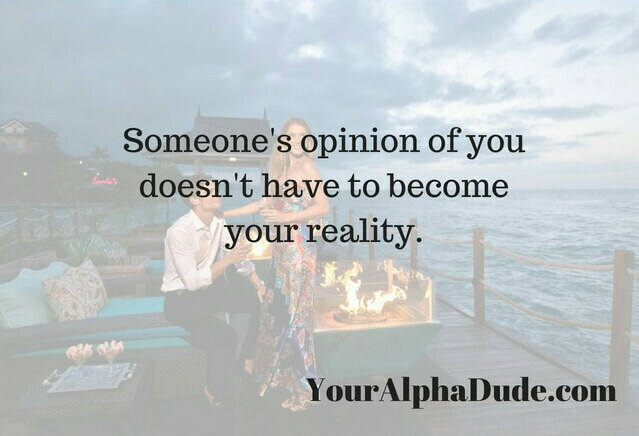 If what i wrote above truly becomes a part of your life and your mindset and you become congruent with those beliefs then she’ll also get these sub-communications out of you and instantly fall into your beliefs that you’re more powerful and she must do the hard work to please you, not the other way around. Always remember, don’t be sold on her. Don’t be a pleaser. Let her please you. Women have a lot of male friends in their lives, and almost all of them act the same needy, greedy around them. Nobody is able to give her what she wants. Maybe, nobody cares what she wants. All she wants is a man who can lead her to a series of roller coaster emotions without even realising what she went through. It should be so stimulating that she gets addicted to it. I think the best way to arouse emotion in a girl is to tease her. For ex – If she has an above average height, say- You’re cute, but too bad i’m not into short girls. [Notice, who has the power here as well, YOU.] Since you’re the one leading her and not the other way around. She is living in your world. These kinds of comments provokes her and creates an emotion inside her. Even though it’s the negative emotion of anger but nonetheless still an emotion and this is exactly to kind you want to create inside her if you want to become more than a friend. The motive of teasing her and throwing comments like those is you need to come off as a dominant male and one who she couldn’t have her way with. This is the trick here. You must come off as someone who she couldn’t have her way with. chances are if she’s a beautiful woman then men are her puppets and you will be the one man she just couldn’t break. Imagine the tension, the emotion that you’ll create inside her. She’ll be burning from inside and want more of you. She’ll always be thinking who’s this guy, who I can’t tame. He’s one wild beast. So, don’t look for her approval, nor wait on her for anything. Just do your thing and lead her into it, if need be. Once you start teasing her and creating that mental or emotional tension inside her then she’ll start testing you to see if you are the man she’s been waiting for all along. She’ll try to create drama, tension and even downgrade you just to see your emotional strength. That’s what ultimately she’s looking for. A man who has serious emotional strength. A man who’ll always be centered no matter what circumstances he faces. Don’t react. Be unfazed. As if nothing happened or it didn’t matter at all. Don’t fall into her trap. She’s just testing you. And the more you react, the more she’ll test you. Turn the test around so it’s YOU testing HER. This is a very important thing i’m letting you in on for free. Offense is the best form of defense. Whenever she tries to test you then don’t go on the defensive and hide. Rather, turn it around and test her back. Let her know who’s the boss around here. It’s time to forever escape the friend zone. It’s time for the bold move. Start touching her, cuddling her in a friendly manner. Touching shows bonding, comfort, acceptance and most of all, trust. This is the number one way to escape the friend zone. As i can promise you no dude in her friend zone got the guts in their butts to touch her or do anything too physical with her. Make touch and physical contact as normal as it could be. Don’t stress it or sweat over. Once you start the conversation and start creating rapport with her, physical contact will happen naturally in the conversation without much hesitation. And take the touches and your touch frequency with her one step at a time. Don’t try to do too much too soon. For ex – At the beginning do something casual, like a playful hit on the arm, or a general hi-five. Then next time, you can touch her back or clasp onto her hands longer and tighter and look into her eyes all the time. And then finally, you can kiss on her forehead and escalate from there to the full fledged lip kiss. After the kiss you have escaped the friend zone forever. Now she fully trusts you and will be ready to do more with you if you play your cards right. In this article we discussed how to escape the friend zone and be more than just friends. And how does it all begin? By how you see yourself? What you’ll think about yourself, is how this world will pursue you. If you think that you can’t be more than a friend with her, then that’s exactly what she’ll do. You need to stand up for yourself and show that bi*ch that you’re a man of value, you’re a man who can please her and give happiness to her better than anyone else. Always have high hopes and beliefs in yourself. Never, ever short sell yourself. Comment below and let me know, on some of your experiences about being friend zoned and did this article helped you with your earlier friend zone problems? 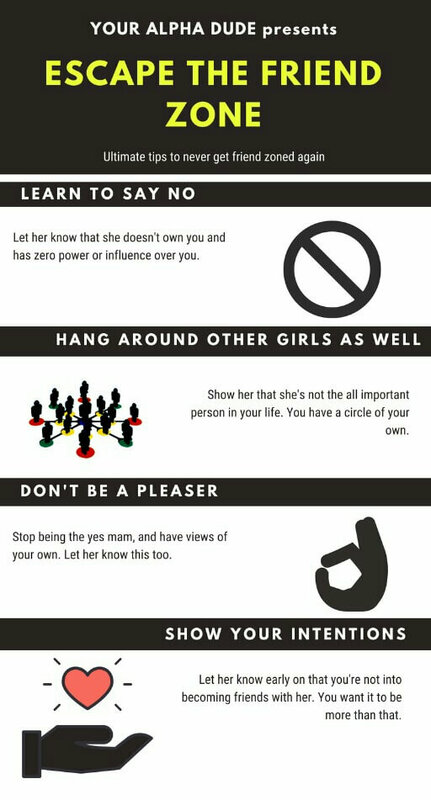 And since NOW you know 5 proven keys to escape friend zone. I want to take to anther level. 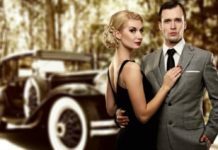 I recommend you to learn the art of seduction and start seducing women right away. ➣➣ Click here to start seducing women to BED. Previous articleTypes Of Girls You Should Avoid And Date – A Comprehensive Guide For Dating Girls.